Recently, a post by Sophia Chua-Rubenfeld called, “How to Study Like a Harvard Student” has been making the rounds on the blogging site Tumblr. Sophia Chua-Rubenfeld is both a Harvard and Yale Law graduate and the daughter of infamous “Battle Hymn of the Tiger Mother” author, Amy Chua. Studying for exams can sometimes be daunting, but if you pay attention, plan ahead, and study effectively, it will make a big difference in how confident you feel and how well you will perform. Read a paraphrased version of Sophia’s helpful tips below. You can find the original here. 1. Choose classes that genuinely interest you – that way studying won’t feel like such a drag. 2. Make friends. See steps 12, 23, 24. 7. Sometimes it can be rough, but buckle down and get it done. 8. Show up to class. Everything will make a lot more sense that way, and you will save yourself a lot of time in the long run. 9. Take notes by hand. It is better for learning and retention and is less distracting than taking notes on a computer. 10. Get out of the library. The sheer fact of being in a library doesn’t fill you with knowledge. 8 hours of Facebooking in the library is still eight hours of Facebooking. Study without sacrificing your quality of life by quizzing yourself while still doing everyday tasks like eating or showering. 12. Give yourself incentive. There’s nothing worse than a gaping abyss of study time. If you know you’re going out in 6 hours, you’re more likely to get something done. 13. Self-care is important, but it can also be really tempting to take breaks when you really don’t need them. When you think about taking a break, try pushing through until you really need one. 14. Stop highlighting. Highlighting is supposed to keep you focused, but it’s actually a one-way ticket to Autopilot Brain. Write notes in the margins instead. 15. Do all your own work. You get nothing out of copying a problem set. If you don’t know how to solve the problem, attempt it anyways and review the answer key afterwards to help you understand what you did wrong. 17. Be a smart reader, not a robot. Ask yourself: What is the author trying to prove? What is the logical progression of the argument? You can usually answer these questions by reading the introduction and conclusion of every chapter. Then, pick any two examples/anecdotes and commit them to memory (write them down). They will help you reconstruct the author’s argument later on. 18. Don’t read everything, understand everything that you read. Better to have a deep understanding of a limited amount of material than to have a vague understanding of an entire course. Once again: Vague is bad. Vague is a waste of your time. 19. If you do not understand an assignment, go to office hours. Ask for help. It will also help you get to know your professors, which is important for any letters of recommendation you may need to seek in the future. 21. If you don’t understand it, it will probably be on the exam. Review your textbooks, ask your classmates, go to office hours, or looking it up on the internet. 22. Do all the practice problems. 23. You will be required to memorize formulas, names and dates. To memorize effectively: Stop reading your list over and over again. Say it out loud, write it down. Have your friends quiz you, then return the favor. 24. Ask your friends to listen while you explain a difficult concept to them. This forces you to articulate your understanding. Remember, vague is bad. 1. Start looking for and applying to scholarships early on. Most scholarships don’t have their applications available until late Fall or early Spring Semester of an applicant’s Senior Year. However, my advice is to stay actively engaged in the process. Reach out to the Scholarship board with questions in Junior year. Have a friendly contact on the board who’ll answer those questions. Routinely check updates on their websites and Facebook pages. The college application process can be already overwhelming without adding the stress of scholarship applications and the paperwork included. My advice is to stay organized with both processes from beginning to end. Have color-coordinated folders for each college and scholarship you’re applying to. Use an agenda and colorful sticky-notes to remind yourself of daily activities and tasks. Make a habit of having an active email account you’ll check daily to answer emails promptly. 3. Something I like to call CSS. Junior and Senior years are the two most stressful years of high school because of all the exams, homework and future decisions you have to do, but if you commit and apply yourself to achieving your goals, it’ll be rewarding when you make them a reality. You may not get into your top university or receive the scholarship you really wanted, but things happen for a reason and hard work will eventually payoff. In the meantime, enjoy your Senior year and stay positive because things tend to work out for the best. Surround yourself with supportive and responsible folks. Count on teachers who’ll write recommendation letters and trust adults who’ll help you keep on track. Make friends who’ll accept you no matter if you end up in an Ivy League university, community college, trade school, or gap year. Who Are Our Bernie Scholars? 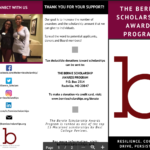 In May 2018, The Bernie Scholarship Awards Program awarded a record-high 63 scholarships of $1,000 each to low-income residents of Montgomery County who reside in subsidized housing. Since its inception in 1995, $600,000 (524 scholarships) has been awarded to 474 scholars. Those are the statistics of a successful and thriving program. However, it is the stories of The Bernie scholars themselves that are unique. Besides lacking the finances to further their education, many have challenging family situations that create a significant barrier requiring them to have a special determination, over and above the typical college student, to improve themselves. Nancy Scull, who was recently elected Board Chair, has been connected for many years with the program both as a volunteer and through her work as Coordinator of the Family Self-Sufficiency Program at Montgomery County’s public housing agency, Housing Opportunities Commission. Having worked with the founder of the scholarship program, Bernie Tetreault, she is familiar with the history of the program and the students it assists. “Many applicants to The Bernie Scholarships have not been strong students, often because they lack confidence in their ability to obtain a college degree and good employment, and they may not have thought much about their chances for college due to lack of funds and their everyday struggles to make ends meet,” says Scull. The overarching goal of The Bernie Scholarship program is to help break the cycle of poverty for its recipients and future generations. Obtaining a college education has been proven to be critical to raising people’s income. 98% of the program’s recipients complete their college degree. Scull says that the majority of scholarship recipients are employed during their academic years. Those seeking a career in a public service field are given priority for receiving a scholarship, as are adults over graduating high schoolers. Bernie Scholarship Board members mentor the awardees to help with problem-solving, encouragement and support, and to provide other resources that they need. Here are profiles of some of our 2018 Bernie scholars. If you are inspired by these fine young people and would like to donate towards future scholarships, The Bernie Scholarship Awards Program is a component fund of the Greater Washington Community Foundation (GWCF), through the Community Foundation of Montgomery County, a subset of the 501(c)(3) GWCF. All donations payable to The Bernie Scholarship Awards Program are tax deductible. Melvin says he’s always had a plan for what he wanted to do with his life. 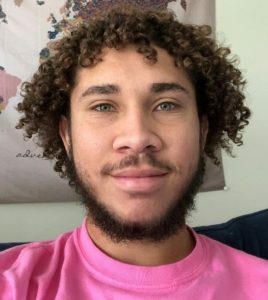 This fall, the Potomac native will enter his junior year at Broward College in Pompano Beach, Florida, working toward a Bachelor’s degree, and eventually a Master’s in Information Technology. He hopes to have the Master’s degree in three years. He earned his Associate’s degree this spring after achieving a 4.0 GPA for the semester, raising his overall GPA to 3.49. His passion is Cyber Security. “The field allows me to make more money, and the job market is always increasing,” says Melvin. “I just wanted to do something that will always be there.” He is particularly proud of doing well in his coding class which he says was “so hard” that more than half the people dropped out before the end of the semester. Nineteen-year-old Melvin has certainly beaten the odds. Brought up by a single mother, he is the third oldest of four children. His mother and father were divorced when Melvin was in elementary school. He says his father has not been present in his life. Not many in his family graduated from high school, so it was an achievement for him when he graduated from Winston Churchill High School in Potomac in 2016. He says his mother has always allowed him to make his own choices, but she always emphasized school as being the most important thing. Melvin’s faith also plays a big part in his motivation to do well. He says the “degree is just the first part” of making a positive impact. In Potomac, Melvin used to volunteer at a recreation center working with and organizing activities for children ages 5-13. Melvin received $1,000 in The Bernie scholarship money this year. It is his third Bernie Scholarship award. He covers the rest of his education by working part-time at the university. If you ask H. Sluyter what she is most proud of, “keeping her sanity” comes to the front of her mind. 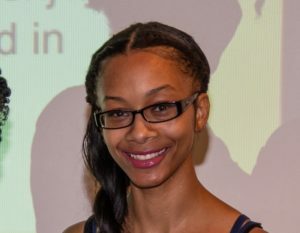 The two-time Bernie Scholarship recipient is the single mother of a nine-year old girl and a six-month old baby boy, she works full-time for the federal government and goes to school part-time at the University of Baltimore. It is a heavy load, but she says she will not give up her schooling. Where she is eventually headed is into the world of corporate law. Sluyter says she finds litigation interesting and challenging and would like to work for a large company. Because of her obligations, she also needs a lucrative career. Recently, she took a macro-economics course, so she’s started thinking about international business or working as a corporate attorney for a company with offices in other countries. She hopes her education, combined with her business and administrative experience, can make that goal a reality. She already has an Associate’s degree in Paralegal Studies from Montgomery College. By the fall, she will have earned an Associate’s degree in Business as well. Technically, she will be a senior next year. In a year and a half, she will earn her Bachelor’s degree in Business and then go on to law school. Her goal is to complete law school in three years. Sluyter starting work at the age of 15. She says she’s worked at Kentucky Fried Chicken, Popeyes, Foot Locker, a call center, and a music store. The past two years she’s been working at the U. S. Department of Commerce. She was recently promoted to Division Office Manager. Due to her full-time employment, most of her classes are taken online and at night. Her first Bernie Scholarship was awarded in 2017. While the Seneca Valley High School graduate has also received assistance through a federal Pell grant and other scholarships, Sluyter says she can only take as many classes “as her scholarships will allow.” That usually amounts to about three classes per semester. She says her income goes toward daycare ($430/week) and for living expenses such as her new home in Montgomery County. She says her mother focuses on her two younger siblings, and she’s happy that “she doesn’t have to worry about me.” “I keep reminding myself that it’s only me, and I have to play all these roles since I have two small children,” says Sluyter. “So how do I do it? How do you make all this happen? 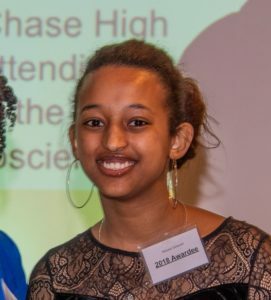 Bitseat Getaneh had every reason to be dissuaded from pursuing her lofty dream of becoming a neurosurgeon. It was August 2016, her first day in the United States, and the then 16-year-old girl from Ethiopia was beginning a temporary stay in Maryland with her host couple. The plan was that she would soon leave Maryland and move to Oklahoma to attend boarding school. Her body was covered with third-degree burns. She was hospitalized and unable to attend high school for four months. She never made it to Oklahoma. Her mother left her husband and three other children to come to the United States to help nurse Bitseat back to health. Most of her family remains in Ethiopia. Move forward almost two years after the tragedy. In June of this year, Bitseat graduated from Bethesda-Chevy Chase High School with a GPA of 3.86. This fall she will begin her freshman year at Bucknell University in Pennsylvania pursuing her dream to become a neurosurgeon. Not only has she been awarded her first Bernie Scholarship, but she was also awarded a Posse Foundation Leadership Scholarship. Out of 1500 applicants, Bitseat says she was one of only 50 to receive this prestigious scholarship, which pays for her full tuition. She thanks her mom for the sacrifice she made leaving Ethiopia and the rest of her family. “I’ve been through a lot,” she says. “I have to pursue this education and make them proud. My host family passed away because of the fire, so I have to make them proud too. I have to make something of myself.” After she gains experience in the United States, she hopes to eventually return to Ethiopia where there is a dearth of neurosurgeons. “I read a quote by Charles R. Swindoll that says, ‘Life is 10% what happens to you and 90% how you react to it.’ That’s when I started to understand that everything happens for a reason. God was trying to show me that death is imminent and that I should embrace life like there is no tomorrow. People should always look forward to the future and not dwell on the pain they faced. Sometimes in life, one has no choice but to rise to the challenge. Two-time Bernie scholarship recipient Tayla Brawner has done just that. This fall, she will enter her junior year at Trinity Washington University in Washington, D.C. By the end of 2020, she will have earned her Associate’s degree in Occupational Therapy and a Bachelor’s degree in Child Psychology. She will then work toward earning her Master’s degree in Occupational Therapy. When she walked across the graduation stage at Springbrook High School in Silver Spring, she was three months pregnant. With many incomplete tasks and personal challenges, she came to a concrete decision on exactly how she would overcome her fear of failure. A couple of months later she was attending Trinity Washington College. At the end of her first semester at Trinity, she gave birth to Madison, who is now seventeen months old. Tayla is a hard worker and has become independent over the last two years with great confidence. She has worked since she was in 9th grade. Last year, she worked two jobs and is currently working part-time at Shopper’s Food Warehouse. She is hoping to find work in an office, preferably as a receptionist or in data entry, while she’s in school full-time this year. At school, she has made the Dean’s List for two semesters. She also had a 3.5 GPA in high school, was a cheerleader for four years and participated in gymnastics as well as track and field. As a little girl growing up, Tayla watched registered nurses come to her grandmother’s house and help her with her daily tasks such as taking her medications, exercising, eating healthy food, and even working on fine motor skills in her hands. “Seeing constantly how these individuals made a huge impact on my grandmother motivated me to want to do something that will help individuals maintain a happy, peaceful, and independent lifestyle with no limitations or restrictions when it comes to their physical, mental, and emotional state,“ says Tayla, who hopes to run her own practice some day. Tayla says she has never had a mentor, although she gives thanks to many who have pushed and helped her along the way, both prior to and after her pregnancy. She has not known anyone in her family to go to college other than her mother, though she is pushing her brother, Tyler, to expand his education. Tayla has been able to afford college through The Bernie Scholarships and a scholarship from Trinity College, which she keeps by maintaining her G.P.A. above 3.3 and going to school full-time. “First off, I would like to thank God who has stood beside me through many trials and tribulations and has never failed me. I remember just like it was yesterday …. walking across the stage graduating from high school three months pregnant with my beautiful daughter, Madison. So many emotions were coming and going that day … from deciding whether or not I was ever going to go to college, to being a great mother, to thinking about pickles and cold cut sandwiches. Fast forward to now, two years later … a current junior student at Trinity Washington University with less than two years to go before I earn my Associate’s degree in Occupational Therapy and a Bachelor’s degree. No, it wasn’t easy, but it was definitely possible and worth it. I have been through so much and I’m pretty sure you all have been through tough times as well, but it does get better. Galatians 6 verse 9 says, ‘Let us not become weary in doing good for at the proper time, we will reap a harvest if we do not give up.’ With persistence, drive, courage, and resiliency you’ll go so many places you’ve never dreamed of.